Since it looks like Blame has edged Quality Road and Battle Plan in our Stallion Pedigree Poll, let's take a look back at Special, Blame's influential third dam. Special (Forli - Thong, by Nantallah) was a full sister to Irish and English Champion Thatch. She made only one racetrack appearance (chart below). 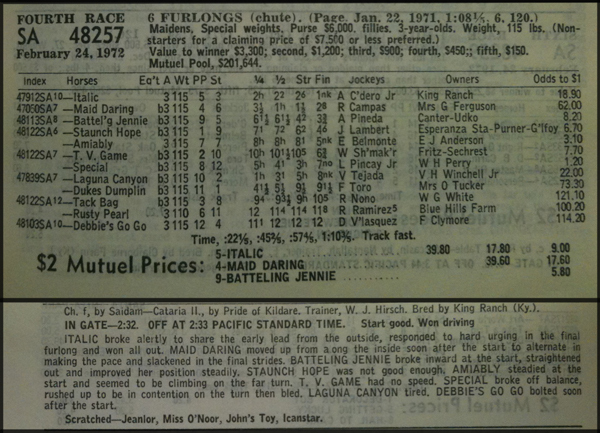 On February 24, 1972, at Santa Anita Park, Special was the 6/5 favorite to win a 6-furlong maiden contest, but it was not to be her day. How's this for a running line? : "SPECIAL broke off balance, rushed up to be in contention on the turn then bled." Despite this racetrack debacle, Special would become ancestress of several important Thoroughbreds. Below is her produce history. 1974, Kilavea, f. by Hawaii. Winner. Dam of gr. III winner Kiliniski; 2nd dam of gr. I winner Bienamado. 1975, Fairy Bridge, f. by Bold Reason. Highweighted Irish 2-Year-Old Filly. Dam of gr. I winner and champion sire Sadler's Wells, gr. I winner Tate Gallery, and leading sire Fairy King. 1977, Nureyev, c. by Northern Dancer. Gr. III winner (disqualified from 1st in the gr. I English 2,000 Guineas) and leading sire. 1978, Wield, f. by Judger. Unraced. 1979, Number, f. by Nijinsky II. Gr. II winner. Dam of gr. I winner and leading sire Jade Robbery and gr. III winner and sire Numerous; 3rd dam of gr. I winner and sire Corinthian (TrueNicks,SRO). 1983, Sort, c. by Nijinsky II. Unraced. 1984, Bound, f. by Nijinsky II. Gr. I-placed stakes winner. Dam of gr. I winner Archipenko; 2nd dam of gr. I winner Blame. 1985, Durrah, f. by Nijinsky II. Winner. 1988, Statement, c. by Private Account. Unraced. 1990, Unnamed, c. by Devil's Bag.